OK one more movie review before talking all things Hong Kong and China. 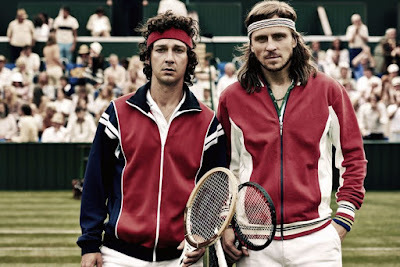 Another interesting movie I watched was Borg vs McEnroe, a story about the two tennis superstars, though more focused on the Swede when he was going for his fifth Wimbledon title in 1980. At that time I was a kid learning how to play tennis and every summer watching Wimbledon with my family was a big event in our house. We would scream and shout at the television when there were double faults, or the ball went in or out. 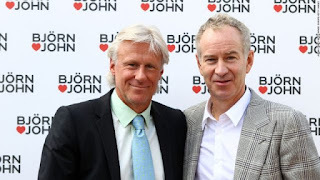 In Borg vs McEnroe, we see the cool and collected Bjorn Borg against the brash and vituperative John McEnroe, but the focus is on the former and how he became the world's number one player. It turns out that Borg was very similar to McEnroe in his abrasive behaviour. As a child the Swede loudly complained to the chair umpire about the ball being in or out, threw his racquets on the ground and brooded. This threatened his burgeoning tennis career until a coach took an interest in his potential but warned him to never show his emotions and instead channel that energy into his playing. As an adult, Borg becomes obsessive about details -- everything has to be the same. He has to be picked up in the same car, stay in the same hotel, his girlfriend meticulously packs his tennis bag and Borg even walks on each of his 50 racquets to check their tautness and from there decides which ones he will use during the match. But for this impending Wimbledon final against McEnroe, Borg seems unsure of himself and unable to control his jitters. Meanwhile McEnroe doesn't have much discipline, though in his childhood his father would parade him at the dinner table with guests to show off the boy's mathematical genius. The night before a Wimbledon tournament, McEnroe is partying in London with fellow New Yorker and player Vitas Gerulaitis, who gives the young underdog intriguing information about his opponent. He explains Borg turns down the thermostat of his hotel room so low so that his heart rate is below 50 (meaning his girlfriend has to bundle up to sleep with him), his parents can come watch him play every other year, but they have to wear the same clothes, and he always carries two towels with him onto the court, no more, no less. McEnroe has his own idiosyncrasies. He gets a marker from the hotel and starts writing out the tournament draws and how he intends to meet Borg in the finals, which means a long list of players he needs to beat beforehand. One of them is Peter Fleming, who thinks they were going to have a friendly match, but for McEnroe it's all business. At last the final begins and it feels literally like a replay of what happened, including a nail-biting 34-point tiebreaker. 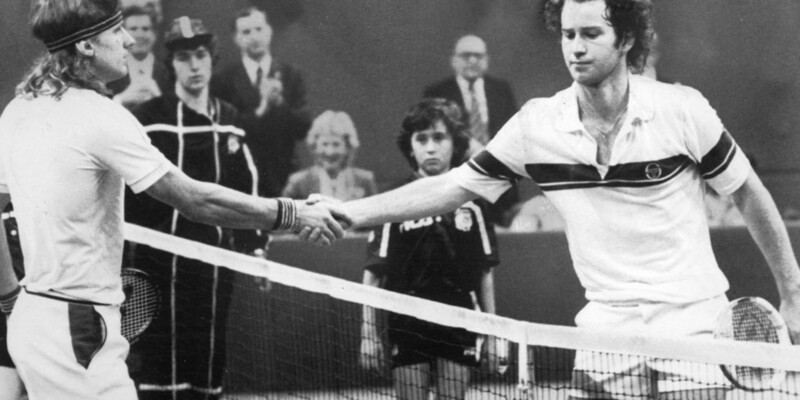 At one point Borg encourages McEnroe to focus on the game, perhaps to show off his coolness. 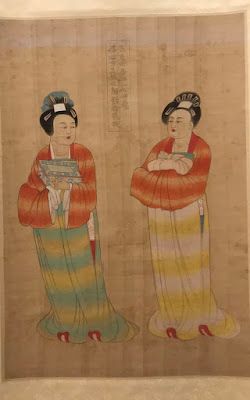 In the end the viewer wonders -- who is the better person? Borg or McEnroe? Was it worth all the hard work, sweat and tears to become these top tennis players? A lot of sacrifices were made to get there, as well as determination. It turns out Borg's real-life son Leo Borg, plays his younger self, which suggests he gave his blessing to the movie. The older Borg in his 20s is played by Severrir Gudnason who doesn't show much emotion, and one can't help but admire his gorgeous mane of hair. Shia LaBeouf is McEnroe, and relies on the usual spewing of profanities and snarky comments to portray the American challenging Borg. The only real part is at the end with actual pictures of the two separately and together. There are also footnotes to say McEnroe beat Borg the following year and the Swede decided to retire at the age of 26. In the film Borg hinted not knowing what he was going to do with his life without tennis, but financially would be fine from all the endorsement contracts. 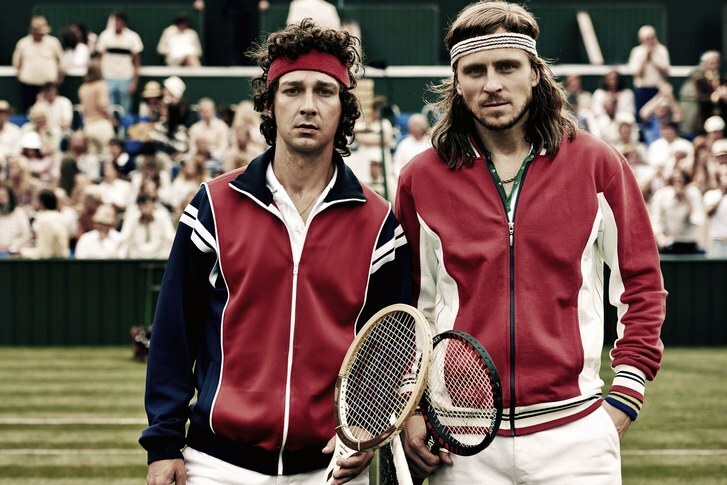 Borg vs McEnroe really gives the psychological insight into the two characters, though the former in particular. Those parts of the film are most fascinating, while the actual tennis match in the end is too drawn out and loses momentum.